Click Split button and check the Split during converting checkbox. Method 1: Split according to the duration with different units, such as Minute(s) or Hour(s), the default value is 30 mins. Method 2: Split according to the numbers of segments, the default value is 2 segments. Method 3: Split according to the chapters. 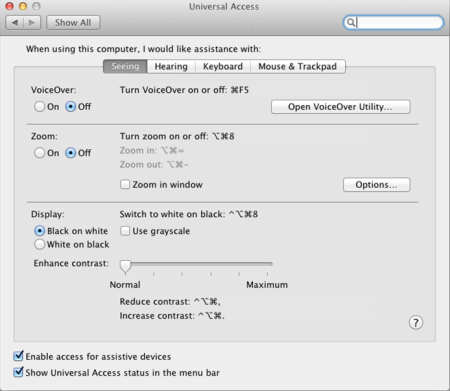 Before splitting by chapters, you need to set accessibility in Mac preferences. And setting accessibility in Mac preferences on Mac OS 10.9.x is different from Mac OS earlier. 1. Select the option Split by chapters on Mac OS 10.9.x or later, then you will see the following dialog popup. 2. Select the option Split by chapters on Mac OS 10.8.x or earlier, then you will see the following dialog popup. 1. The Split by chapters option only works on the original file with the chapters. 2. If you have already checked the Enable access for assistive devices checkbox, there will be no window pops up when you set Split by chapters option. Check the split files and Click Convert button. After the conversion finished, the number of split files displays on the list and the segments can be played in sequence.